During a recent visit to Walikeria Prison, members of the Waikato branch (Northern Commandery) of the Order of Saint Lazarus, were led by Chevalier Dr. Neil Algar QSO, KLJ and his wife Dame Eunice MBE, DLJ. The Order presented the regional manager, Mr. Harry Hawthorne with a defibrillator life pack. 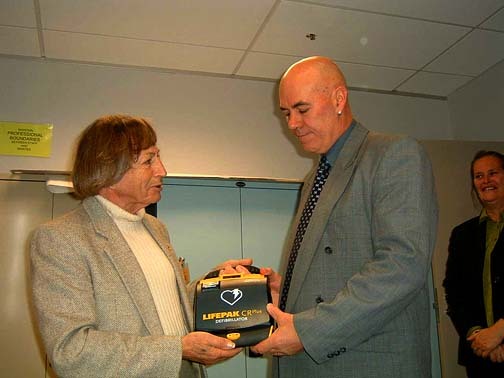 Dr Algar handed over the defibrillator to Mr. Hawthorne with the words: "Harry, I hope that you never have to use it." Mr Hawthorne then presented the defibrillator to Sharon Young who is the head of the medical team, and Senior Nurse Denise Hunt then gave a demonstration on the use of the life pack. Defibrillators are used for the resuscitation of patients who's heart has stopped beating. Being in an isolated area it takes Saint John's Ambulance quite some time to reach the jail, in an emergency, and the defibrillator was certainly welcomed as a first line item of equipment for the prison's medical staff. The Order of Saint Lazarus has also donated a large number of books to the prison library which were welcomed by Librarian Rae Jolly. The Order also donated several hundred books and magaznes to the newly established woman's unit of Waikeria Prison. The Order of Saint Lazarus is a community-based organisation based along similar lines to the Order of Saint John. Both organisations were originally established during the Crusades. The Order of Saint Lazarus was, in the Middle Ages, made up of Christian Knights who had contracted leprosy. A branch of the Order of Saint Lazarus was established in New Zealand, in 1963, by members of the medical profession. The Order concerns itself with skin and eye ailments, and runs a retirement village in Raglan and Henderson. (This article was previously published in the Te Awamutu Courier and the Matamata Chronicle.